When I first began researching unconventional home construction concepts well over a year ago, I was primarily interested in ways to get off the grid in a world of peak oil, increasing utility costs, and dependency on “the system” for our most basic needs. What I quickly learned was that there are a number of methods people use to to do this, one of which is called an Earthship. An Earthship is the brain child of Mike Reynolds, an architect by trade and hippie at heart who in the 1970’s began exploring ways of building homes using recycled materials. Over the years, he and a group of like-minded individuals established a completely off-grid community near the desert town of Taos, NM. The Earthship design makes use of several key elements. Earthships are surrounded on three sides by some form of thermal mass. The reason for this is that once you get below the Earth’s frost line (which isn’t very deep) the Earth is actually a steady 58 degrees F no matter where you go on the planet. So, if a house is essentially wrapped in this thermal mass layer it will naturally want to achieve equilibrium with this temperature. 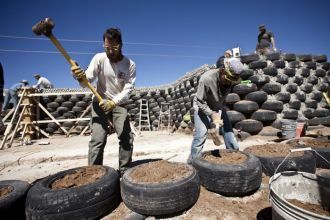 There are several ways to do this, but in keeping with Mike Reynold’s desire to use recycled material, the traditional Earthship method is to used “rammed-Earth” tires, pictured at right. This is a very labor intensive process of tightly packing dirt into used tires and then using them to build the three main thermal-wrapped walls of the house. However, this is not the only method one can use. It’s possible to achieve the same result using straw bale or concrete. The fourth wall of the house is primarily glass windows and must be facing the equator (that’s south for those of you in the northern hemisphere). During the day the sun’s solar energy heats the interior of the house, much like a greenhouse, and the thermal mass absorbs much of this heat. When the sun goes down, the thermal mass then releases this heat back into the house, providing warmth during the night. Preferably the glass would be angled to line up with the sun at noon on the longest day of winter, but this isn’t required. 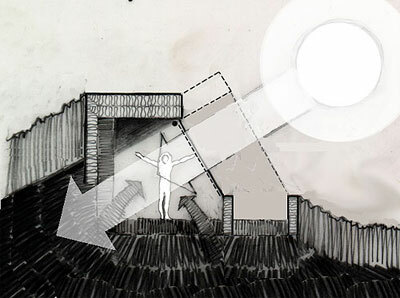 In the summer, because the sun is higher in the sky, less direct sunlight comes in so it doesn’t get too hot. Vents are also placed on the ceiling of the house that can be opened to allow heat out if needed. The net result of all this is a house that requires zero utilities to heat and cool itself. For extremely cold climates (like Canada or high up in the Rocky Mountains), inhabitants will often make use of a small wood burning stove for added warmth, but you’d be surprised at how little wood burning is actually required. Rainwater is harvested from the roof of the Earthship and channeled through gutters into a cistern that’s buried in the ground behind the house. Again, the thermal mass maintains the water at or about 58 degrees. These cisterns are then plumbed into the house through a series of pump-driven water filters that remove sediment and purify the water. Finer filtration is used for water that’s intended for drinking. Once water is used and goes back down the drain, this greywater is then run through a series of greenhouse planters that line the front windows. Greywater actually contains quite a few nutrients for plants, so this waste water is put to good use by feeding the plants. By taking these nutrients from the water, the plants actually clean the water and, true to the Earthship’s recycling efforts, the water is returned to the toilets so that valuable drinking water isn’t wasted on flushing toilets. Now considered black water, water from the toilets is flushed into a septic tank. Any excess water flowing through the greenhouse planters is also redirected to septic. 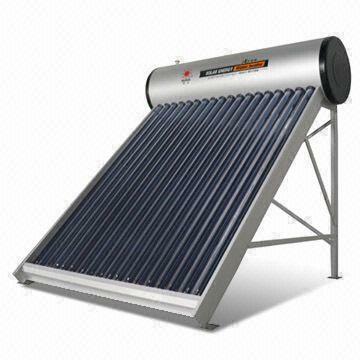 Hot water is typically heated using a solar hot water heater mounted on the roof and/or a gas-powered water heater inside the house itself. These types of hot water heaters are becoming more and more common and are usually gravity driven thermosiphons. Cool water in the tank sinks to the bottom of glass tubes that get heated by the sun. Once hot, the water rises back up the tubes and into the tank. The tank is then plumbed into the house for showers and the kitchen sink. Finally, the Earthship achieves power to make all these systems run using a series of solar panels mounted on the roof. As in any truly off-grid home, these solar panels feed into a chain of deep-celled batteries (like those in golf carts), which store the electricity until it is required for use inside the house. The size of the solar system will depend on how many appliances and electrical devices the owner intends on using. All of the rooms must be along the front windows in order to make use of the passive solar heating, so the interior design tends to be quite linear, but there’s a lot that can be done with that (see slideshow at the end of the post). The ceiling is usually constructed using logs and the interior walls make use of plaster since traditional sheet-rocking does not insulate or absorb heat, which is required for the house to function. One of the hallmarks of Earthships, obviously not required, is using old wine bottles to allow light to pass from room to room as well as achieve a sort of stain-glass type aesthetic. It does look quite cool. The fact that the water system isn’t gravity driven means you need pumps to achieve flow within the house. This means more moving parts that need servicing and will at some point break or need repair. This is true of the water filtration system as well. One of the reasons Mike Reynolds had to create the water filtration system is because of government bureaucracy and permitting requirements. He needed to demonstrate the the houses were as safe and clean as any regular conventional home, so he was essentially forced to add a lot of extra mechanization to the house’s systems. The house, although technically off the grid, does rely on gas for cooking and heating hot water. In a perfect world, I would like to remove any dependence on fuels that I can’t produce myself. As the world’s oil supply tightens this will inevitably lead to higher prices on fuels, not to mention larger supply restrictions. I believe there are easy solutions to this problem so would probably address those in my final house design. Earthships are actually quite expensive, especially if you have somebody build it for you. It can cost about $250 per square foot, which is downright unaffordable. I actually spoke with one of the architects that’s worked on Earthships since the 70’s and who now owns his own company designing off-grid homes. He said you could get it down in half if you did much of the work yourself, but this still seems expensive. This is due largely to the amount of glass, built-in systems, and labor (if hiring help). Overall, Earthships are awesome homes and the only limitation is the imagination on what you can do with it. If the subject of Earthships has peaked your curiosity, I encourage you to watch the “Garbage Warrior” documentary on their history.